There comes a time in every bullet journalist’s life when their journal is nearing its end and they must make the transition to a brand new journal. It is a bittersweet time. The thought of a new journal, untouched and full of potential, is enough to leave any red-blooded stationery addict quivering with excitement. But the closing of a chapter is sometimes sad and nostalgic, much like moving out of a beloved home. The emotions aside, it can be tough to decide what to bring along to your new journal and what to leave behind. 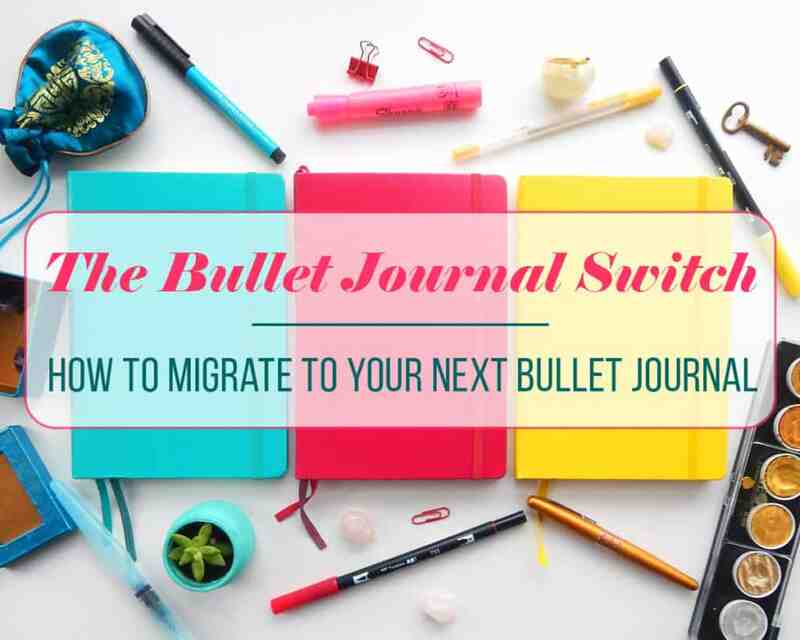 I’m here to walk you through my bullet journal switch so you can see exactly how I tackle this migration. The era of the Berry is over, and the reign of Lemon has begun. I’ve had lots of people ask me what should come along to the new journal, but that’s a tough question. It really depends on each individual and their needs. You have to take into consideration that you’ll have to redraw or rewrite each entire collection if you decide to migrate it, but ask yourself: is it worth the effort? Is this spread important and still relevant to my life? If a collection or spread will continue to be used again and again, then it probably should make the cut. If you haven’t touched it in a while, then perhaps you should leave it be. Think of it as packing for a trip. You could bring everything you might possibly want or need, but it isn’t always practical to do so. Besides, it’s not like you’re going to pitch your old bullet journal the second you’re done with it, right? It will still be sitting on the shelf if you need to look something up for reference later. Don’t overthink it! Some people might decide that nothing will remain relevant, so they don’t migrate a thing. For others, there might still be a few things worth keeping around. Here’s what I migrated and continued into my new Leuchtturm 1917. Of course I had to keep my monthlies going! These fellas are wildly helpful, so there was no reason to change this system. Unfortunately the timing was wonky and I made my bullet journal switch in December instead of January, but I’ll survive that annoyance. When I started my Berry Leuchtturm for the first time last May, I wrote a post all about overcoming the first page fear. That first page is an obstacle for lots of people starting their bullet journal journey because of the overwhelming fear of failure. I was no different when I began Berry. I’m very pleased to say that I’ve grown since then. I could look that first page right in its face and conquer it no problem. I started on page one and painted a wreath on it to welcome in December, complete with gold paint and all! The reason I did this instead of a mandala or an inspiring quote was because my mantra for this year is “Done Not Perfect”. One of the neatest side effects of bullet journaling for so long is learning to accept mistakes and move on. This applies to so much in my life: art, planning, lettering, and just any other project. I used to be paralyzed with fear because my work wouldn’t be perfect, so I’d never start. Now I’m doing much better at completing projects despite their imperfections. The first page of my new journal reflects that philosophy, and hopefully will be a theme throughout the life of this notebook. I created my very first Goals and Rewards chart way back in May of 2016, but so much has changed since then in my life. That’s why I created a new and improved version with a contract to hold myself accountable during 2017. I’m excited about my new rewards and I can’t wait to start earning prizes for my good behavior! 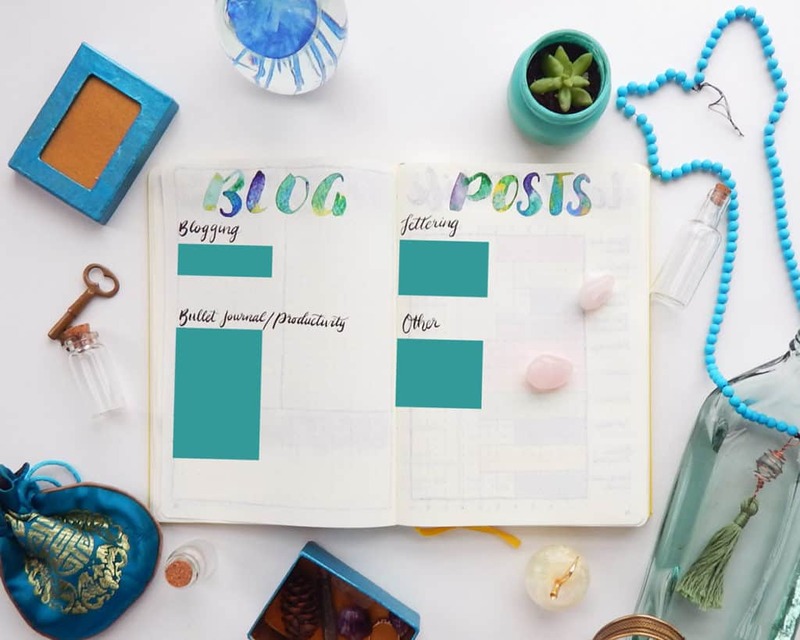 Obviously not every bullet journalist needs a blog post idea page (unless you want to start blogging, in which case I got ya covered). But as a professional blogger, it’s a necessity. It’s one of the few collections from my bullet journal for bloggers post that is actually getting migrated in the bullet journal switch. I need open space to brainstorm and come up with that sweet, sweet content. My header pretty much the same as last time. I used water brushes and Prang watercolors to create that splashy lettering that I love so much. I also used my brand new Tombow Fudenosuke Brush Pens for the subheading. They are quickly becoming brush lettering favorites! A new journal is the perfect place for a brand new Level 10 Life chart. This handy little technique from The Miracle Morning is incredible for introspection and self-assessment. You should absolutely give it a try. They’re super easy to draw out and really make you think about your happiness and how to improve your life satisfaction. I try to do mine about once every six months or so. Luckily, my Berry Leuchtturm lasted about six months exactly! 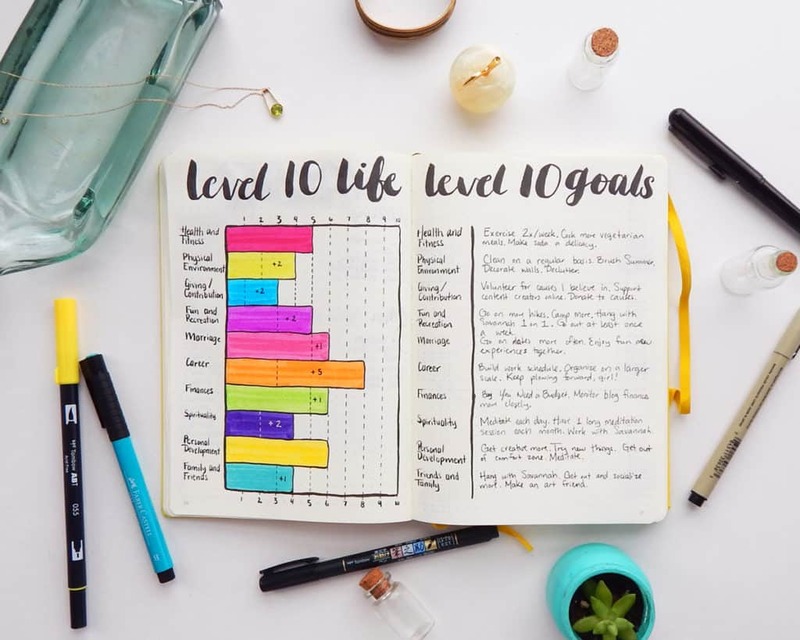 If that rate keeps up, then I’ll be drawing up a new Level 10 Life chart at the beginning of every new bullet journal. I need to keep an eye on the future, don’t I? I recently created a future log that served me well, but I knew I would need a new one when I made the bullet journal switch. So I recreated the spread almost exactly as it was before, but with six months of future planning instead of only three. I loved my metallic Gelly Roll pen so much that I used it again for my headers. I did add one new factor that my old future log was missing – the calendar thumbnails. Being able to see this information at a glance is fantastic, particularly while scheduling appointments. I created my Master Grocery List pretty early in my last bullet journal, and I used it every single time I went to the store after that. It has been wildly useful, so it naturally had to migrate in the great bullet journal switch. This time, however, I tucked it away in the back of my Lemon so I wouldn’t have to flip around to find it. I’ll just use a strong binder clip to keep the pages from fluttering around while I’m shopping. With my grocery list, I did something extremely rare for me. Usually I update the look of an old spread, especially something as old as my grocery list. But I decided that I loved the old look, so I kept everything almost pristine in style, I used my pink and blue Tombow Dual Brush Pens with Microns just like last time. The only thing I changed was the font of brush lettering to be more cursive. I still adore this spread and I love getting funny looks while I’m grocery shopping. Just like my Master Grocery List, I needed to keep this wonderful spread around. My recipe bank has helped me actually use those recipes I pinned years ago, and it makes sure we don’t get stuck in a dinner cycle. Because the whole thing is Post-It Notes, I only needed to peel them out of my Berry and stick them in my Lemon. Easy peasy! I did need to letter the header, but that was easy with my Pentel Pocket Brush Pen. 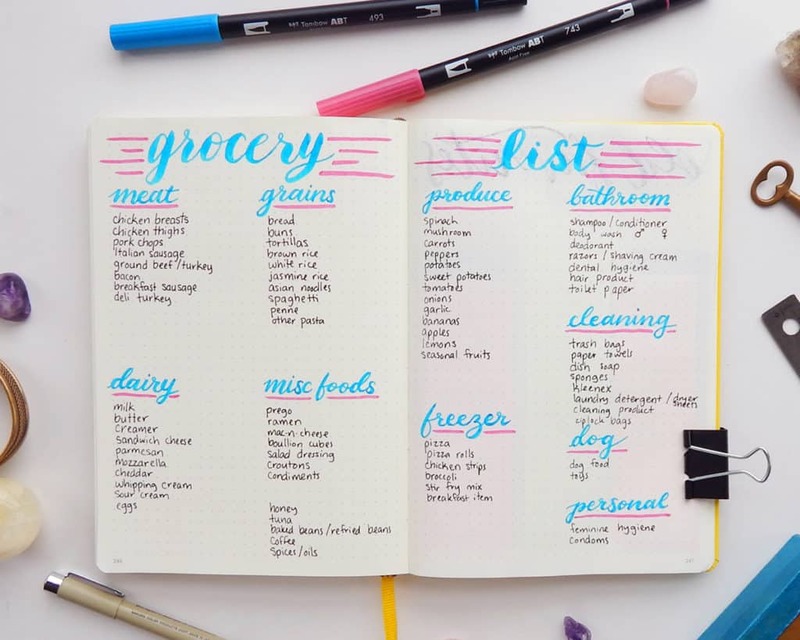 This time I even stuck it next to my grocery list in the back of the journal so I can plan meals and write what I need to get from the store all in one handy place. There might be dozens of collections that you want to bring with you during your bullet journal switch, but it doesn’t feel practical to redraw them all again. What do you do when you want to keep all these old spreads relevant? Thankfully, there are several techniques that might be just the solution you are looking for. This seems like a no-brainer, but it helps a ton. Make sure your index is ship shape so you can easily reference your work later. If you didn’t index your collections for some reason throughout your bullet journal (some people only index dailies and monthlies), then you can add a special “Collections” section to your index. There, you can add each collection in chronological order for quick reference later. I personally haven’t tried threading yet (one of these days! ), but I know other bullet journalists have used this technique with great success. 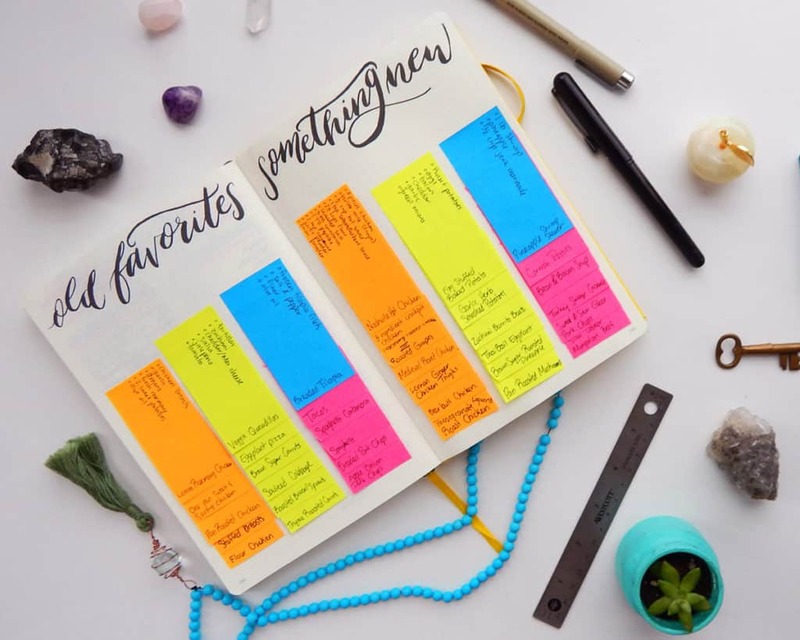 Page Flutter describes the technique in her post Bullet Journal Hacks that Actually Work. This might be perfect for people who don’t want to refer to the index for old collections in old journals. You can keep threading through all your bullet journals to keep track of a single type of collections. Pretty neat concept, huh? Some people swear by the technique of keeping a separate notebook just for collections. The idea is that you simply draw out all your non-planning spreads in a different notebook so they don’t get lost in a sea of dailies. A separate journal might also be perfect for people in the middle of a huge project, like moving or planning a wedding. 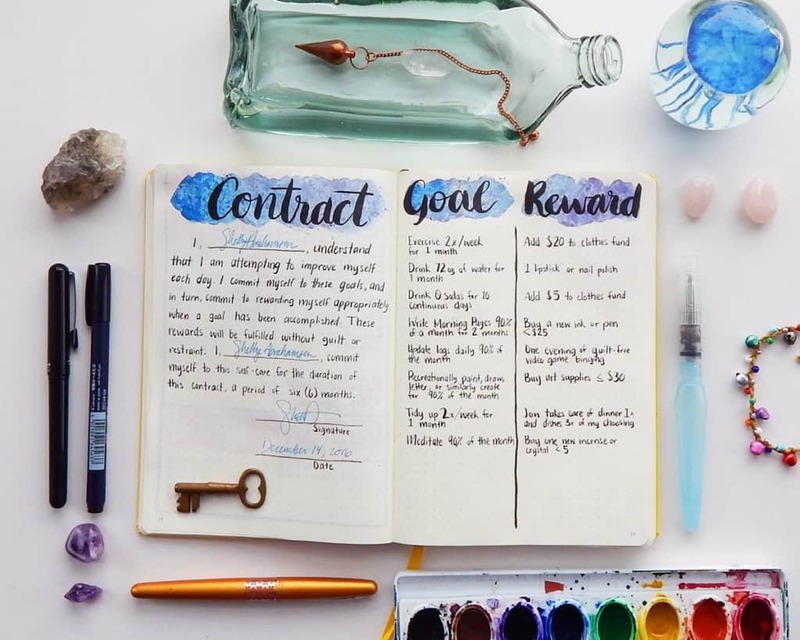 This technique is also a great opportunity to try out different brands of journals before committing a whole bullet journal. I recommend trying out Northbooks notebooks for a collections journal. Maybe a Moleskine is the way to go if you’re a dedicated Leuchtturm lover like myself. It never hurts to try! Regardless of how you choose to handle your bullet journal switch, remember to stop and pat yourself on the back. Getting through an entire journal is a big deal! At least it is for me, as I spent my life starting new notebooks and never finishing them. I have now completed two bullet journals and I’m over the moon to be on number three. And that’s not even counting my Morning Pages journals. I’ve completed three and I’m working on number four! Don’t worry too much about the bullet journal switch. If it’s freaking you out, go slow and take your time. You don’t need to do it all at once. I didn’t! I kept Berry sitting on my desk for nearly three weeks while I finished up the migration. Going slow helped me overcome any nervousness that came with making the bullet journal switch. It also helped me really think about what I needed in Lemon. And pro tip: if you decide halfway through your new bullet journal that you need an old collection or spread, you can always add it. There’s absolutely no reason that you can’t add stuff later on if you think it will be helpful. So don’t sweat it! In the end, you have taken a huge leap in personal progress when you close out a literal chapter of your life. It took me two years to get through my first bullet journal. Berry took six months. I’m excited to see how I will grow and use my new Lemon to face the challenges ahead of me. It’s time to start a new chapter and charge onward! P.S. 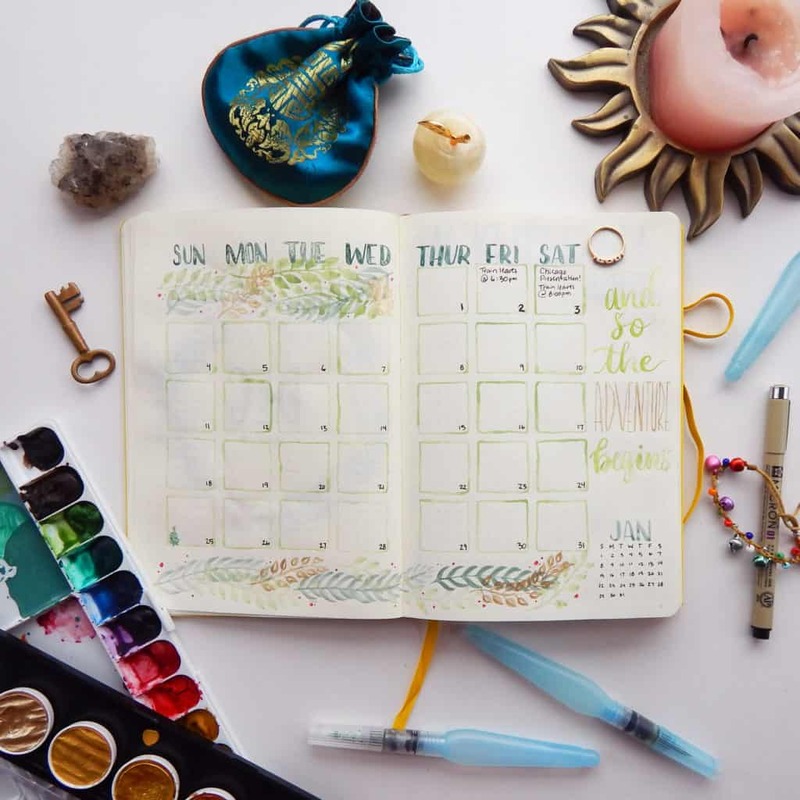 If you want some free planner printables to help you out, you can get them by signing up to the Fox Den Resource Library here or in the sidebar. You’ll love the video tutorials, worksheets, and other goodies available! « Create Your DIY Tabletop Chalkboard & Add Charm to Your Work Space! Hello, your site is so cool! I am about to switch to a new Journal, which should begin in September, but no one has covered the following questions: 1) the future Log – do I start it from september 2018 to december 2019? 2) Should I add a yearly overview from september to december of the next year (2019) since likely the journal will continue into the next year? (but It will take up quite a numberof pages, as well as the future log, because for my next one I would like to change from 6 months a spread to maybe four… as I need more space… Thank you! Hey Vicky! Congrats on switching to a new journal, it’s such an exciting transition! I would definitely start in September. It’s easy to get sucked into the idea that your planner has to start neatly at the beginning of the year or halfway through the year. But life doesn’t happen in such neat little boxes, does it? If you have a good idea of how many months you’ll spend in this journal, then I would set up your future log to reflect that. So if you expect to wrap up this journal in December of next year, set it up that way. Or, if you prefer, set up an overview period of 6 months. 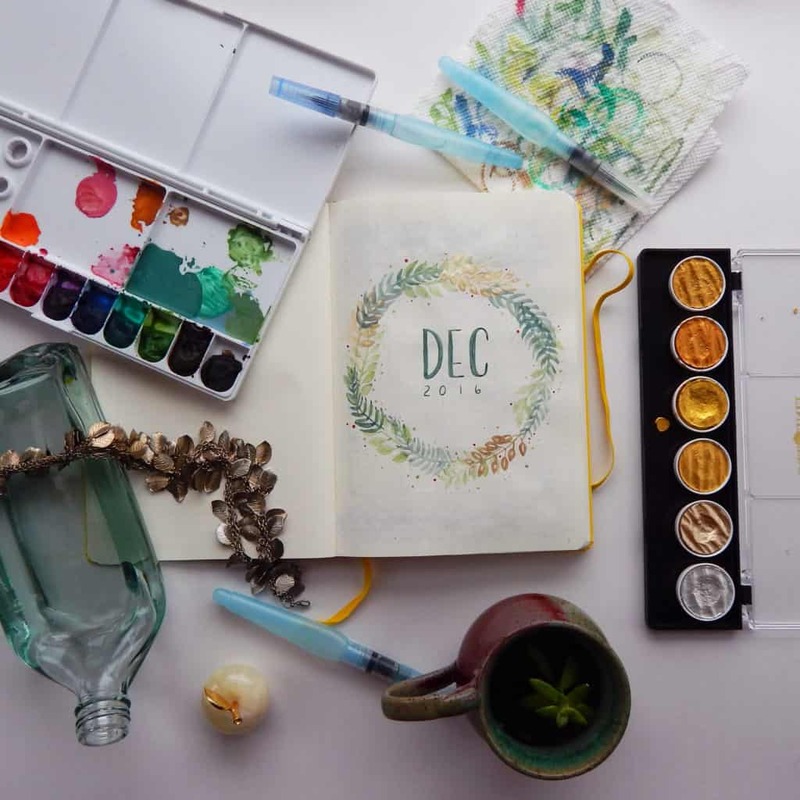 Then when you reach the end of that six months, you can create a new spread wherever you are in your journal for the remaining time until December. I hope that helps and good luck making the switch! Thank you! I wasn’t able to check if you had replied until now -.-”… mmm I don’t know how many months it will last, but do you think that if I create future log for september to december, and then for the whole of 2019 it will be ok? so then I could do the regular monthly and at the beginning of 2019, which I assume being some way before the middle of the book, make a 2019 opening page? Fab! I’ve just started migrating from my first bullet and it was so nice to look through at all the things I tried (even if some of the things aren’t moving on with me). This article has got me even more excited to move on. Thanks. Thank you for this! I don’t know why I got so nervous about starting a new one. Do I need my list of which books I’ve returned the library 3 months ago? No. I know exactly what you mean, Mollie! I think that the bullet journal just becomes something of a nest or a home-away-from-home, and it is so hard to let those little details go! It helps to remember that you can safely tuck your little journal on the shelf so you can rifle through it if you need to. I’m thrilled that you liked the post, thanks so much for reading! I’m thrilled that this post was helpful to you Jenn! 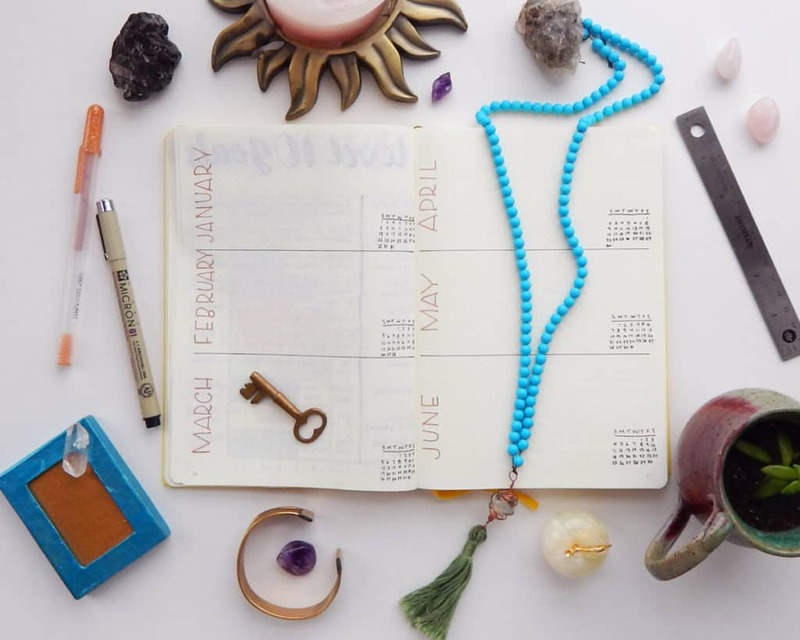 Your Teal journal sounds like it was extremely useful if you got through it in 3 months. Kudos on filling a journal with things that make you happy and help you take care of yourself! Moving journals can be a bit nerve-wracking, but it’s great once you’ve settled in. I hope you find Lemon to be a happy, bright spot in your life!